Freely open the lanai doors off the living room and the Maui Dolphin House instantly fills with fresh island breezes and natural sunlight, creating a relaxing tropical atmosphere throughout. 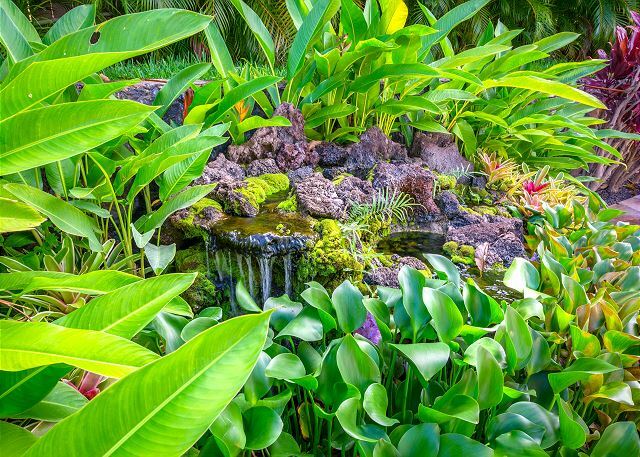 Indulge in the many wonders your peaceful oasis offers! Upon your arrival to this remarkable gem, you will encounter an electronic gate with its very own uniquely programmed access code. As you continue along your lengthy, inviting driveway, you are surrounded by very tall, mature Palm trees as you make your way to a very spacious, covered carport with room for up to four vehicles. Should you arrive at night, this pathway will be lit up to welcome you to your home away from home. 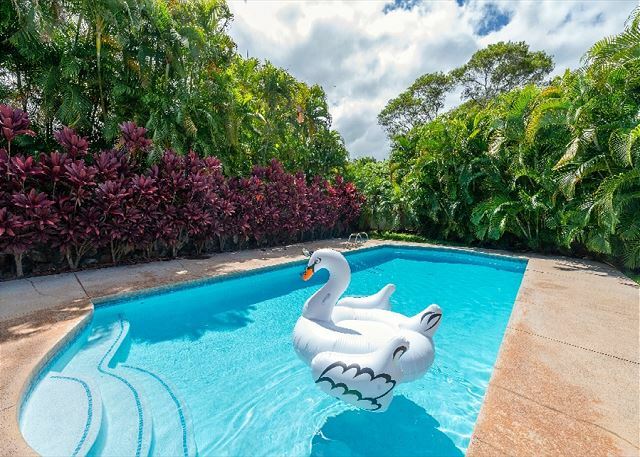 This glamorous house is surrounded by beautifully manicured landscaping, which includes three glorious subtle water fountains, gorgeous floral beds, tall Eureka palms, a very large grassy lawn along with your own private pool, outdoor shower, and barbecue area. This exquisite home offers an open floor plan, with an extraordinary, renovated kitchen. Your spacious, fully stocked gourmet kitchen is equipped with gorgeous stainless steel appliances and a wine cooler for your inner wine connoisseur. The kitchen countertop includes bar seating for three. Enjoy a meal at the dining room table with seating for eight as you gaze out the endless windows, overlooking your crystal clear swimming pool. The dining room and living space includes amazing vaulted ceilings, two ceiling fans and exquisite bamboo flooring. The living room is decorated with plush furniture, and boasts state of the art electronics. Two entrances adjacent to the living room lead you out to the large, beautifully tiled lanai. Here, you will be able to listen to your favorite tunes through the patio speakers and experience stunning ocean and mountain/Haleakala views while sipping on your favorite beverage. When in season, indulge in delicious mangoes right off your tree as you relish the beauty surrounding you! The Maui Dolphin House sleeps up to eight people with ample sleeping arrangement possibilities. The bedroom windows will open onto lush greenery. Melt into peaceful bliss as you relax in your own jetted, garden tub and rain shower head soaking in the soft sun rays through the glass block window. With four spacious bedrooms and three full bathrooms, you are sure to find the dreamy comfort & rest you deserve. One of the bedrooms has a king size bed that is able to be converted into 2 twin beds. If you are interested in have 2 twin beds please advise prior to arrival. You will have a blast in the recreation room downstairs, while preparing your favorite island fare. This wonderful rec. room is fully-equipped with a full size refrigerator, bar area, futon and has direct access to the patio BBQ, glistening swimming pool and large backyard. A full size washer and dryer will be conveniently available inside the home so you can save time on packing and luggage space. This extravagant home has everything you need to enjoy a flawless vacation! Maui Dolphin House is situated in a very safe and friendly family neighborhood. Here you can relax and live with everything open and truly enjoy the tropical pure air, while at the same time, keeping your privacy. 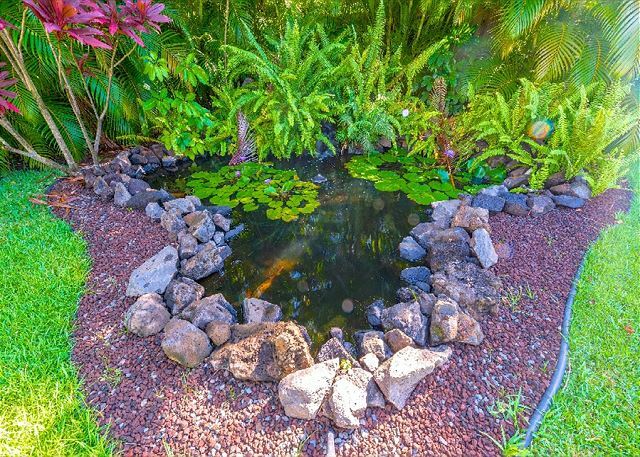 The Maui Dolphin House is located in the prestigious Maui Meadows neighborhood in sunny South Maui, within minutes to the exclusive resort community of Wailea. Wailea is known for award winning golf courses, championship tennis, spas, exclusive shopping and abundance of restaurants with a wide variety cuisine options. The Dolphin House location is also near South Kihei, a perfect base for exploring the island and taking advantage of all that Maui has to offer. Just steps away are some of the world’s most beautiful beaches, superb shopping, renowned restaurants, and world-class golf. Maui’s unique and varied terrain offers a multitude of activities.